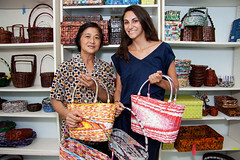 Lucy Goh has volunteered with the Salaam Wanita eco-basket project for 7 years. In a word, she is indispensable. Lucy isn’t deterred by the two hour commute from her house to the eH office. On the contrary, she arrives early in the morning, ready to do whatever tasks need to be completed to help the office be more organized and run more efficiently. From preparing the inventory for sales at fairs to folding and sorting hundreds of plastic bags used to protect the baskets during transport, Lucy completes numerous, time-consuming assignments that are essential to sustaining the project. Due to other work commitments, Lucy is only able to come to the eH office once per week, but she accomplishes a great deal during that time. Knowing that her work makes it possible to sell the weavers’ baskets gives Lucy the determination to work hard. Helping others is a central part of Lucy’s lifestyle and outlook on life. As someone who has struggled with SLE (Systemic Lupus Erythematosis), Lucy spends three days a week counseling other lupus patients and their family members through the SLE Association. The causes for lupus are unclear, and the symptoms vary for each person, making this autoimmune disease especially difficult to diagnose and understand. Lucy shares her own experience and offers advice to those who are coping with this illness. SLE destroys the body’s own healthy tissue can cause joint pain, anemia, rashes, reproductive complications, inflammation of the heart, kidney failure, anxiety, depression, and other symptoms. There are many different kinds of lupus, and the 90% of the people affected are women. Accepting and treating the disease is emotionally draining for patients and their relatives. When family members are unable to cope, Lucy often accompanies patients to the hospital for check-ups, helps families make decisions about appropriate nursing homes, and acts as a support system for those who are feeling hopeless. Lucy feels fortunate that she has three children and a husband who have provided a strong support system for her. Even with her family’s support, Lucy has experienced the depths of depression from SLE herself. She was undergoing a severe relapse when her close friend and eH part-time staff member, Justina, visited her. Justina encouraged Lucy to get out of the house and start volunteering with the eco-basket project when she had the strength to do so. She took Justina’s advice and motivated herself to visit the eH office. Lucy began her relationship with eH has a weaver herself. She also volunteered to take others who were without transportation to the trainings. To create the base of most baskets, the weavers use wire wrapped in magazine paper. Pulling the wire taught to create a clean weave caused Lucy to get many cuts. As an SLE patient, Lucy needs to be careful about maintaining her health. The cuts could become infected and her condition could worsen. Instead, Lucy began rolling paper for the more experienced weavers to make baskets. In return, she would make $15 USD for every 1,000 sticks rolled. This work also proved difficult because each weaver had a different preference for the length and width of the rolled paper. The weavers’ particularity for the paper rolls was a blessing in disguise for the eco-basket project. 7 years after first visiting eH, Lucy is the backbone of the office and an indispensible team member.